What Exactly is Chronic Sinusitis? When we talk about Chronic Sinusitis in ENT we are talking about a “chronic” or “long-term” (at least 6-8 weeks and often much longer) inflammation or “itis” of the moist thin skin that lines your sinuses (also called “mucosa”). Your sinuses are the air-filled bone cavities in your facial bones. So, when we say Chronic Sinusitis we are really just saying “long-term inflammation of your sinus linings”. Chances are that you have had at least one sinus infection in your life which usually starts with a cold or allergies. In most cases you would experience quick onset (over a day or so) of intense pain over one of your sinuses with lots of greenish yellow nasal drainage on the side of the involved sinus. Acute Sinusitis also frequently produces a severe headache and sometimes even facial tenderness over the infected sinus. Acute Sinusitis is very common and almost always an “acute” or short-term inflammation of your sinus linings (usually less than 5-7 days). Also, and this is most important. Acute Sinusitis is almost always purely a bacterial infection. For this reason, a 10-14 day course of an oral antibiotic like Augmentin, or a Z-Pac are very effective in eliminating the infection and your Acute Sinusitis. However, Chronic Sinusitis is very different than Acute Sinusitis!! It is a lower-grade inflammation that does involve bacteria in some respect but is much more than simply a bacterial infection. It is a low-grade, dull, pressure, with aches (often of more than just one sinus) type of chronic inflammation. In most cases there is also extensive soft tissue swelling and inflammation of the nose or what we call "Chronic Rhinitis". For this reason, it is often referred to in our specialty as "Chronic Rhinosinusitis" (both nasal and sinus inflammation). Because it is more than just a short-term bacterial infection it often is not cured by antibiotics or medicines alone. Previously most Chronic Sinusitis that failed medical treatments would require a General Anesthesia to cut the sinuses open. However, over the past few years a new treatment using a Balloon ("Office Balloon Sinuplasty") to gently open the natural sinus openings can be done in Dr. Lueg’s office with just topical anesthesia (without any needles or going to sleep). What does Chronic Sinusitis Look Like? In most cases your family doctor or an ENT specialist will diagnose you by your symptoms and physical exam findings. 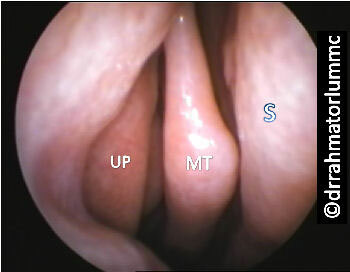 An ENT will also usually perform a Nasal Endoscopy. Many patients have asked me what this tissue looks like. It looks very much like the skin lining your mouth but much more swollen and boggier looking.